Condemn Petraeus and Interim Chancellor Kelly! Uphold the CUNY 6 and the Campaign to End the Militarization of CUNY! The interim CUNY chancellor William B. Kelly recently sent a letter to the Board of Trustees regarding the September 17, 2013 demonstration against a fundraiser at Macaulay Honors College featuring “professor” David Petraeus and apologist for U.S. imperialism Fareed Zakaria. The demonstration was organized by the Ad Hoc Committee Against the Militarization of CUNY, a united front in which the Revolutionary Student Coordinating Committee (RSCC) is a leading participant. New Delhi: On 21st September (Saturday), a joint protest against growing ‘State Repression on Cultural Activists’ was organized by a number of cultural, political and student activists of the city under the banner of Daman Virodhi Sanskritik Manch despite heavy rain between 2 pm to 5 pm at Mandi House, the Cultural hub of the national capital. Following is the note circulated by the group. Pictures by POOJA PANT. Repression of people’s movements and struggles of workers and peasants have intensified across India. A recent manifestation of this is the crackdown on cultural activists and intellectuals – numerous cases of sanctions, physical attacks, incarceration and arbitrary arrests have surfaced in the last few months. 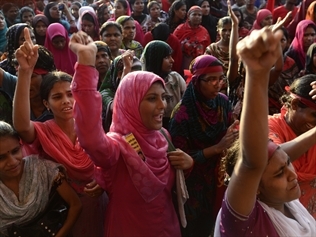 ANGRY Bangladeshi garment workers have blocked roads, set factories alight and clashed with police for a third day as protests demanding a minimum monthly wage of $US100 spread outside the capital Dhaka. Abdul Baten, police chief of the Gazipur industrial district near Dhaka, which is home to hundreds of factories, said on Monday “up to 200,000 workers” had joined the latest demonstrations. 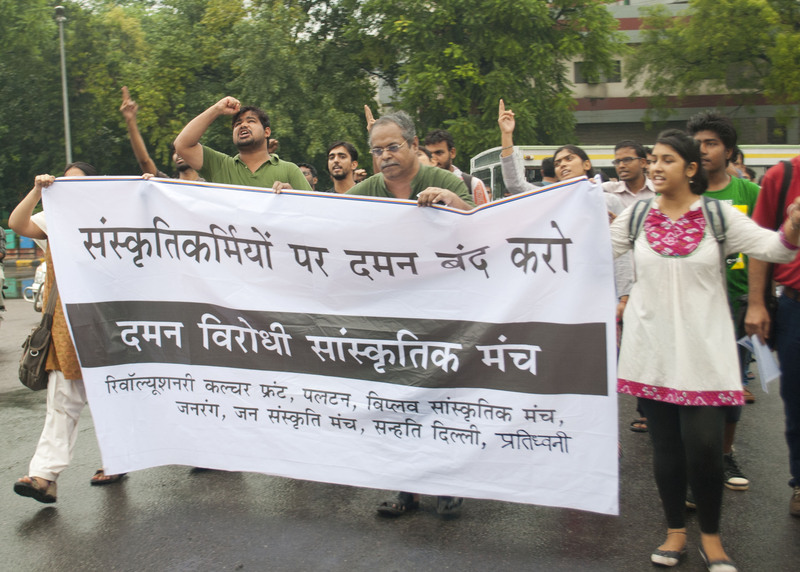 On September 12, in a joint operation in India, a 50 member squad of police personnel – comprising of members of National Investigation Agency (NIA), Delhi police, Special Cell of the Delhi Police and Maharashtra police – barged into the Delhi University staff quarter of Prof. G. N. Saibaba, a noted civil rights activist and professor of English at Ramlal Anand College, University of Delhi. The wheel-chair bound professor is a Joint Secretary of the Revolutionary Democratic Front (RDF) and the convener of several forums against ‘Operation Greenhunt’ and the persecution of millions of adivasis and tribal population of Central and Eastern India. He teaches English at Delhi University. Down with imperialist aggression against Syria! USA, hands off Syria! Proletarians and oppressed people of the world, unite! In the last months, the imperialist Yankee has intensified its manipulations and provocations to justify its military invasion in Syria. The US propaganda machine is once again creating smokescreens to justify to the world public yet another predatory war. “To defend democracy,” “human rights”, “stop use of chemical weapons and weapons of mass destruction;” these are the new smokescreens of the Yankee imperialism in its counter-revolutionary offensive, reviving the “War on Terror”. These were also the same pretexts used to justify the aggression towards Afghanistan, Iraq, Mali, Libya, and many other countries. by the very forces who are the most responsible for countless massacres and use of weapons of mass destruction in human history; imperialism, mainly Yankee. 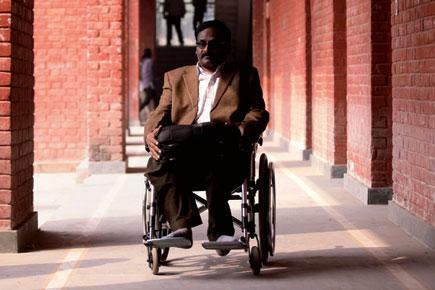 Is GN Saibaba, the wheelchair-bound professor of English in one of the country’s premier university, the new face of Naxalism? The Maharashtra Police raided the home of Delhi University professor Saibaba last week, alleging that he is an active member of the banned CPI-Maoist. On Thursday, 12 September 2013, a 50 strong police contingent drawn from the Maharashtra Police Force, the Delhi Police Special Cell and the Maurice Nagar police thana, raided the residence of Dr. Saibaba, an Asst. Prof. in English at Ram Lal Anand College. They brought computer technicians with them. Dr. Saibaba, his wife and their minor 15-year old daughter were detained for about four hours from 3.00 PM onward for an investigation into the use of his residence “as a place for the deposit of stolen property”. Immediately, the iron main gate of the house and the house door itself were locked from within and physically barred by police personnel, and phones of all including the driver were seized. The driver’s phone was destroyed, and all other phones were seized. At the end of the search, two phones were returned after the teachers in DU protested about leaving the family with no means of communication. Dr. Saibaba was not allowed to contact his lawyer, or his colleagues to ensure that the “investigation” would be a fair and transparent one. Teachers who reached the spot volunteered to be observers. But they were not allowed into the premises. During the course of this wholly baseless investigation, the entire family was kept captive –sometimes individually – prevented from making or receiving calls, or meeting anyone who sought to meet them. The police locked themselves into various rooms of the house for long periods of time. Two terrified local barbers were picked up by the police and brought in as “neutral observers” for some part of the raid. They were also coerced into signing on the seizure sheet as witnesses. The police left sometime after some DU teachers arrived, began questioning the police and informing the media about the incident. After much persistence, the teachers managed to get the terrified child produced. The police left after confiscated a large number of college documents, pen-drives, a laptop, a tablet microchip, mobile phones (including the minor daughter’s phone), debit and credit cards, and bank passbooks, none of which items were “stolen property”.